�PAPIER D�ARM�NIE� — Who Today with Armenian Roots or Connections Knows Anything about �Papier d�Arm�nie?� A request for information if anyone has ever heard of it, or better yet used it. 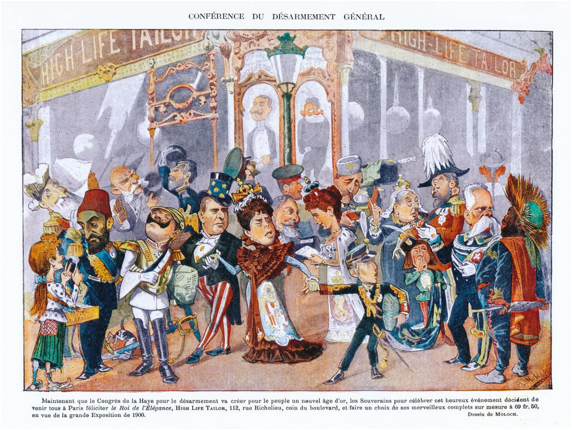 Commentary on a Cartoon Featuring Various European Powers at an Elegant Parisian House of Fashion Anticipating the Opening of the Peace Conference at The Hague on 18 May 1899. Sultan Abdul Hamid II is approached by a seller of the deodorant �Papier d�Arm�nie.� This seemingly simple act has a story to tell. Written or print records necessarily deserve pride of place in studies dealing with history in general, but we think it is slowly becoming better appreciated that visual documents such as photographs, drawings, films, cartoons and caricatures and the like can provide substantial support for textual materials. They can also disclose a fair number of other very important dimensions or add nuances of understanding for a more complete and therefore much more accurate perspective of a given topic, or of the times in general. A caricature which is at the same time both quite easy on one level to unravel and considerably more difficult to unravel on another level is one that we intend to focus in this article. To do so will require us to focus on one rather narrow aspect of a very interesting color cartoon or caricature deriving from the Hamidian period. (Incidentally, the use of the word �cartoon� is not only used in referring to something that elicits laughter. In many countries, e.g. Britain, the word cartoon is still widely used to refer to any drawing or schematic that aims to represent or explain something in a simplified way.) We�ll also interject here that we by no means intend to suggest even remotely that cartoons in the comic sense of the word were drawn and presented in reference to any of the Armenian persecutions. To do so would be grossly incorrect because all that we are aware of were highly sympathetic and inevitably reflected shock, sadness, or resolute anger at what had or was happening, and even extreme disgust at inaction towards ending any given or ongoing persecution. The various persecutions committed against Armenians in the Ottoman Empire, especially those dating from the period of Sultan Abdul Hamid II and afterwards culminating with the Turkish Genocide against the Armenians have been the subject of many cartoon drawings, satirical renditions and caricatures of the events and the parties in question - from the supposed or imagined perspective of both victims and perpetrators. Some are straightforward and readily interpreted even today. Others provide much more of a challenge since detailed understanding of a social and political context from a period considerably more remote in time and space than today�s present is required. But we hasten to say that it is not our prime purpose here to say much on this front. Indeed, to do so would deserve much more space than can be allocated here. The Figure below is a caricature from 1902 drawn in the satirical and libertarian illustrated weekly magazine L�Assiette au Beurre [The Butter Plate] No. 72, 16 August (Paris). It might be regarded as a cartoon or satirical caricature which presents an average challenge in terms of ease of interpretation today. Sultan Hamid II is shown on his throne (or the altar of humanity?) holding in his left hand a bloody �something or other� – it appears too slender for a sword and he seems not to have used a walking stick, perhaps it is an orchestra conductor�s baton. No matter. The caricature, in translation, is captioned �The Jitters of the Shadow of God on Earth� and shows a paranoid, terrified and cringing sultan covered with blood, indeed dripping with blood, and virtually surrounded by the bloodied dead crying out. But this caricature, even this kind of caricature, is not the main subject here. It is merely presented here to give a concise idea of the kinds of issues one must deal with if one is to offer plausible interpretations. Cartoons and caricatures have sometimes been referred to as �editorials at a glance.� But if they are to effectively reflect or editorialize to today�s viewer or student of history, then it is of utmost importance that one first has to have a realistic and accurate understanding of what the message was - not what one wants it to be. In 1989 Dr. John Ahmaranian published a softcover volume of some 246 pages comprised essentially of cartoons and caricatures from various publications relating to the Armenian massacres, especially relating to, but not only from the Hamidian Period. His book was entitled �An Answer to Turkish Denials.� From this title it is clear that he believed that cartoons could serve as a form of proof for the reality of the events they portrayed. Since it was designated volume 1 one would expect that others would have followed but so far as we are aware none has appeared. Obviously it would have provided a fuller picture had one been published. Be that as it may, there is a long-standing tradition of publication by or about Armenia and Armenians providing a look at various problems or situations through the eyes of the cartoonist or caricaturist, both professional and amateur. �Way back when�, the relatively short-lived, black and white satirical monthly Apdag (western Armenian pronunciation) or Aptak [The Slap (in the face)] edited by the Huntchagian leader, spokesman and author Avedis Nazarbek or Nazarbekian, dating from 1894 was published. It is of substantial interest and very few, if any full runs of this periodical exist today. Apdag is but one of several examples of extreme political caricature and cartooning that is of great historical interest worthy of detailed study today so far as things Armenian are concerned. We can assure you that the effort required will be considerable but the reward will be substantial as well. Some drawings are quite gruesome and blatantly flagrant; others are, however, considerably more subtle. (The British Library has microfilmed it.) Several years ago Dr. Anahide Ter-Minassian wrote a very interesting article on Armenian satirical drawings in the French Armenian satirical journal �Gavroche� or �Kavros� presumably named for the street urchin character in Victor Hugo�s �Les Mis�rables� (see her Les dessins satiriques das le p�riodique arm�nien Gavroche (1908-1920) in R�vue de la monde Mussulman et de la M�diteran�e No. 77-78, 1995 (pgs. 123-143.) Gavroche too, especially issues from the early period of its publication in Constantinople, is a very rare publication. Le Rire. Journal humoristique (Paris) was a tabloid format French language illustrated humor magazine on relatively simple paper stock but which enjoyed wide popularity for many years as a weekly from 1894 to 1940, and then after a break during the years of World War II, as a monthly from 1946 to 1971. The vertical dimension was initially 31 centimeters (12.2 inches) but was later reduced to 24 centimeters (roughly 9.5 half inches). 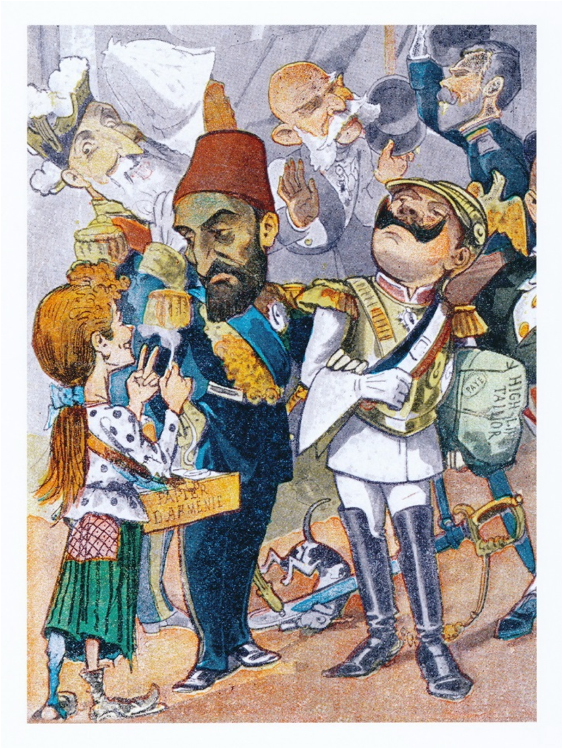 Over the years Le Rire featured many cartoons, some lithographed in spectacularly bright colors, that related especially to Sultan Abdul Hamid II and the Armenian �question�[Haigagan Hartse] as well as the case of merciless persecutions of other Christian subjects of the Ottoman Empire. The issue of 20 mai [May]1899 [5� ann�e, no. 237] appearing two days after the opening of The Hague Peace Conference, featured on its back cover a full turn-page lithograph showing the various heads of state gathered at the elegant Parisian clothes outfitter �High Life Tailor.� See Figure below. The upper caption says in translation �General Disarmament Conference.� The caption below translates as �Now that the Conference on Disarmament at The Hague is about to create a new Golden Age for the people, to celebrate this happy occasion all the Sovereign Heads decided to come to Paris to congratulate the King of Elegance, High Life Tailor, 112 rue Richelieu, corner of the boulevard in sight of the Grand Exposition [the Exposition Universelle] planned for 1900, and to make a selection from the made-to-measure, wonderful complete outfits for 69 francs 50 centimes.� [The �made-to-measure� sur mesure refers to tailor-made, elegant, indeed wondrous or spectacular costumes.] We have not investigated the �High Life Tailor� but suspect that it actually existed. Parenthetically, or not so parenthetically, as some have undoubtedly read, Abdul Hamid II was a sultan who was rumored to have Armenian blood in his veins—his Armenian mother being Islamized! Some writers have gone so far as to say that it was an open secret in the royal residence the Yildiz Palace. We need not bother here with details concerning the exact identity and very apt caricatures of each of these various heads of state. Queen Victoria and her son who would become King Edward VII will be easily recognized, as will Emperor Franz-Joseph of Austria-Hungary, the very dark skinned King Menelik II Emperor of Abyssinia at the far right. (In all, representatives of 26 countries attended.) We think each and every one of the portrayals is very engaging and the detailed characteristics of the whole lot, cabal or otherwise, on the world scene could be the subject of a lengthy analysis. What concerns us here, however, is shown at the far left of the lithograph above. See Figure below. A rather dark-complected Sultan Abdul Hamid II, not terribly tall - he was in fact well below average height by today�s standards - is shown in Fez and full regalia arm in arm with his dear friend German Kaiser Wilhelm II (who was only 5 feet 7 inches tall!). [Note: Various �Turk�-run or sponsored web sites make the claim that Sultan Abdul Hamid II was rather tall – he was not, talk about �tall tales.� Note also the dog whose neck is spewing forth a puddle of blood- it has apparently been �accidentally� cut with Wilhelm�s oversized sword.] The Sultan is being approached by a young girl who might ordinarily be assumed on first glance to be an impoverished seller of cigarettes or the like. But No, she is offering him what appears to be a lit strip of �Papier d�Arm�nie� - best translated here perhaps as �Armenia Paper.� The tray of goods hung from her neck is clearly marked �Papier d�Arm�nie� so there is absolutely no doubt about that. For us to understand better this aspect of the caricatures, it became clear that we had to look into what was meant by �Papier d�Arm�nie.� Despite being widely traveled, we had never heard of it, nor had we encountered it in our extensive readings and had to do some research. It is not easy to do this sort of investigation since this kind of thing falls into the category of ephemera. It is often notoriously difficult to find reliable relevant information without a disproportionate amount of effort. The �Papier� which could be regarded as an �incense paper� was used as a deodorizer or air freshener and was apparently sold on the French market from around 1885 or so onwards. It was available in pharmacies and hardware stores (�quincailleries�). Even some small businessmen or agent vendors hawked it on the streets of Paris. It was supplied in little boxes of booklets �carnets� of twelve sheets of paper cut into threes. The mode of delivery of the fragrance to the air is rather distinctive and quite clever, and clearly its design had to be thought through carefully. To start with, the paper had to be carefully selected so it would burn at a controlled rate without too much smoldering. Then it had to be properly infiltrated with a solution of the aromatic resin, in this case mainly styrax benzoin, produced by a tree (not one native to Armenia or Ottoman territories incidentally but to southeast Asia). Not an easy task. One is instructed to take a small sheet, light one end with a match, quickly extinguish any flame and allow it to burn slowly in some sort of burner, support or tray and it would gradually release its distinctive fragrance. It was not only promoted as a room deodorant but an air purifier and sanitizer, sick room fumigant, anti-cholera agent etc. The original �Papier d�Arm�nie� was developed by Auguste Ponsot (1846-1907) with the help of a pharmacist by the name of Henri Rivier. The �Papier� is touted in Wikipedia and the like as having been �crowned with success for two years in a row first as a winner of the "M�daille d'Or de l'Exposition d'Hygi�ne [Public Health and Hygiene] in Paris 1888, and next at the World�s Fair in Paris in 1889 - the �Exposition Universelle. Clearly far more research needs to be done to render any of the above commentary on the history of �Papier d�Arm�nie� acceptably documented and citable, rather than anecdotal. At one point one even reads that Ponsot went to �Armenia� (where that may have actually been is not specified) and claimed to have seen benzoin being used there as a deodorant. All that would sound pretty exotic to a Frenchman or Frenchwoman, no? Perhaps we should nowadays merely view it as advertising �hype�? We generally put such marketing strategies in the same category as claiming herbal shampoos containing Oriental ginseng foster a healthy scalp, unless one can prove otherwise. Clearly all products from the Colonial regions were imaginatively used – even as far as the smoking of perfumed opium in Paris! Armenian chocolatiers have plied their talents in Belgium and France for more than a few years and we do not think it impossibly far-fetched to think that an �Armenian� knowing about styrax benzoin might have come into the picture that way. Alternatively, and probably more likely in view of our general skepticism on such matters, it was pure and simple a case of French style �Madison Avenue� advertising to invoke exotic Armenia and perhaps capitalize on it as an item from the distant �East� or Moyen Orient. If we were not so certain as we are that well-known French author, and Member of the prestigious Academy Pierre Loti was a determined Turkophile and equally adamant Armenophobe, we might well have even wondered if the likes of a Loti did not have his hand in the matter of promoting things Orientale in Paris. We venture to opine that �Papier d�Arm�nie� would be eclectic enough to appeal to him. We carried out a bit of more reliable digging on Monsieur Ponsot and learned that he earned his Docteur �s Sciences from the Universit� de Paris in 1896 with a specialty in Sciences Physiques [actually more like what we would today call physical chemistry from the looks of his thesis title]. A book he wrote did not receive a favorable critical review. most Armenians or those with Armenian connections will be familiar with the use frankincense - khung or luban (in Arabic) for air purification and in celebration of the Liturgy or Badarak in Churches. Just how many have heard of �Papier d�Arm�nie� we hope to find out. Checking with a few non-Armenian friends who were born and grew to adulthood in France and who routinely visit Paris and elsewhere in France recall its use but have not recalled its use on a regular basis. The same with Americans who have studied and worked in Paris or Bruxelles or Holland. Conclusion, �Papier d�Arm�nie,� whether used today in France or Belgium, seems nowadays not to be exactly the somewhat popular item that it might have been a century ago. Perhaps its use will be taken up in Los Angeles area among Armenians if it is marketed diligently enough by someone enterprising enough? Joking aside, and be all of the above as it may, some additional commentary on our �Armenia Paper� is therefore certainly called for. The atmosphere before and at the Conference as it was convened certainly needed, diplomatically stated, more than a little freshening. Perhaps our sarcastic quip should be qualified by asking whether one could really clean up the air by burning a few sheets of �Papier d�Arm�nie.� Of course we doubt it. When Russian Czar Nicholas II and his ministers came up with an Imperial Rescript in 1898 supporting a meeting of the Powers at which arms reductions would be considered, the world was baffled. The whole suggestion seemed ludicrous and provoked skepticism, and the oft-heightened publicity about the value of such a Conference was taken with the proverbial grain of salt by anyone who mattered. One can only imagine what the Turks thought of the Russian proposal. The entire idea of such an operation appeared to �stink on ice� as the irreverent expression goes because of the clear-cut hypocrisy that was in evidence to those who would open their eyes. So far as the word Arm�nie was concerned, in any context whatever, noun or adjective, one encounters major problems so far as official Turkdom was concerned. Ermenistan was blotted out as best they could. It is very easily documented that Sultan Hamid II did everything possible throughout his forty year reign, to suppress, even eliminate the very word Armenia (whatever the language) from the vocabulary of any of his Ottoman subjects using a wide range strategies and machinations. A word or two seems in order about the Conference that was being ridiculed by the cartoonist �Moloch.� The so-called First Hague Conference, often referred to as the Peace Conference, was convened as mentioned above on the initiative of the Czar of Russia Nicholas II, and was scheduled to start on 18 May 1899 in The Hague. One of Czar Nicholas� relatives, distant cousin Queen Wilhelmina of the Netherlands, had been gracious enough to offer her capital as the venue. (Hence an early beginning of the self-styled name of The Hague as �The City of Peace and Justice.�) The main objective of the Conference was to consider ways of dealing with differences and crises without resorting to war, and to set standards for the conduct of war and behavior to which all could agree. (We shall add gratuitously here that setting standards for the conduct of war itself was/is an oxymoron. The British General Lord Herbert Kitchener said more than once that �All war is an atrocity!�) We would argue that no one with the proverbial half a brain should try to contest that view. Although many, if not most of the distinguished attendees at The Hague were highly skeptical of both the intent and certainly the outcome, and really wondered exactly what we would now term �a hidden agenda� might be, it is viewed by scholars today as the first serious effort to codify behavior in international crisis management and even to work towards disarmament. If taking the trouble to assemble is considered �serious attempt� then we say, so be it. 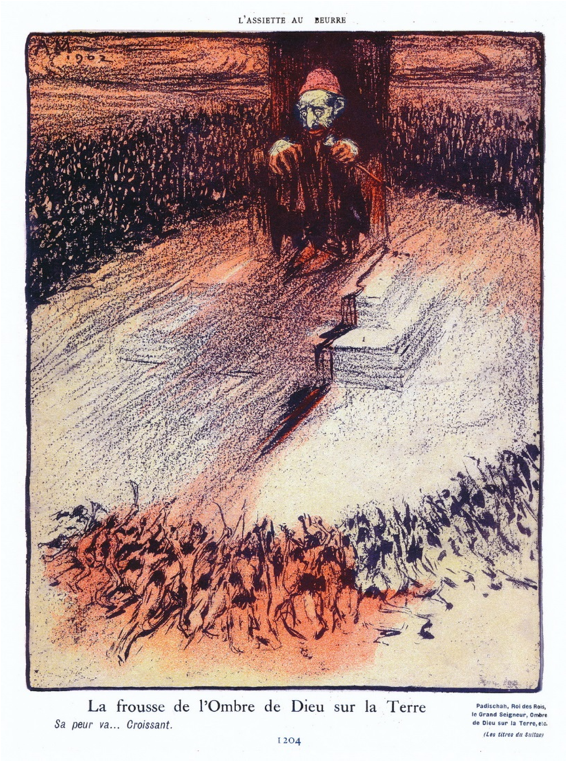 The demeanor of the attendees in Moloch�s cartoon, who were of course themselves not in attendance - their appropriate representatives were there – is very telling. Of course Sultan Abdul Hamid II was neither in Paris nor The Hague. None of the other sovereigns was in attendance either. (Ambassador to Berlin Andrew Dickson White, former President of Cornell University, shown in our first Figure wearing U.S. flag-striped trousers along with a star bedecked high hat � la Uncle Sam, headed the United States of America contingent.) The Ottoman representatives were reported in the New York Times as the Privy Councilor Turkhan Pasha, Secretary of the Foreign Office [Mehemmed] Noury Bey, Lieutenant General Abdullah Pasha, and Rear Admiral Mehemed Pasha (see New York Times Tuesday May 16, 1899 pg. 7; also Arthur Eyffinger�s The 1899 Hague Peace Conference: �the parliament of man, the federation of the world� - The Hague and Boston: 1999). Everyone, except the Armenians, seems to have appreciated that nothing would come out of The Hague Peace Convention that had even remote relevance to things that mattered to Armenians, or we venture to say anyone else if one uses standards of lasting accomplishment as the measure. The Ottoman Empire was too large and offered too many incentives to the Sovereigns so far as future exploitation was concerned to do anything other than pay lip service to the problems and complaints of the Armenians. At The Hague, so far as we have been able to learn, not even lip service was paid. Although the word geopolitics had come into existence in the late 19th century, it would take too much effort to see if the expression was ever openly used among the discussants. It is, of course, a perfectly good word to describe where anyone was coming from, as they saying goes today. Great Britain of course was concerned only with securing her Empire in India so far as keeping the Ottoman Empire propped up. So far as Imperial edicts or the like were concerned, promises to improve the lot of the Christian subjects - especially the Armenians - were ignored from the proverbial day one. What was released for public consumption or what one read or was promised was generally a very far cry from what was delivered. One example:- We read in The Advocate of Peace� (published by the American Peace Society, Boston) in November 1899 that �Sultan Abdul Hamid II issued an Imperial Irade ordering the rebuilding and repairing, with the assistance of the government, of the churches, the monasteries and schools which were destroyed during the Armenian massacres.� Our response:� Oh?� Produce the evidence that this was done. We have looked and have found none. Perhaps like everything else it lies buried in the sacrosanct Ottoman Archives? When the Young Turk Revolution occurred in 1908 and Sultan Abdul Hamid II was forced to abdicate in favor of his brother Mehmet Rashid, who was girded with the sword of Osman as Sultan Mehmet V, Armenians and others sincerely believed that matters would change. We all know they did not. But that is another story. We hope we have shown that a caricature or cartoon, with a well presented and properly interpreted message can tell a significant tale.